At this year’s LiNC, the Big Thinkers’ session track challenged old thinking and was filled with breakthrough approaches to help you elevate engagement and deliver superb customer experiences. With data, frameworks and thought leadership, our Big Thinkers shared innovative ideas that helped attendees establish a Total Community strategy across their organization. Now you can get all the information too. Download the LiNC ’16: Big Thinkers’ Lounge 4-Pack for all the content that was shared and the information you need to stay a step ahead in your industry. With many brands still struggling to realize the power of social marketing, this report explores the key attributes social relationship tools must deliver to foster rich, dynamic and interactive relationships with customers. You Have the Customer Data. Now What? Today, data is not only informing and driving businesses, it’s becoming central to the products and services they offer. This report addresses the impact of data proliferation and how it may be used creatively and effectively to drive competitive advantage. Our Chief Scientist, Dr. Michael Wu, has patented a continuum of techniques that can help you choose the right gamification plan for your customers. In this report, we dive into the science behind gamification and provide guidance on how to be successful with gamification. Brands think they’re doing well with social media, but where do you stack up? 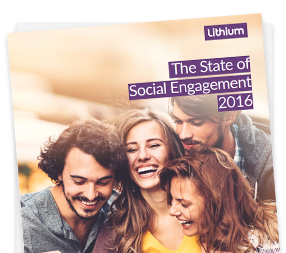 The State of Social Engagement looks at eight industries and 85 Fortune 1000 companies to determine how strategic and effective brands are across their social ecosystems.